There are multiple funding options available to you for various courses through State & Federal Funding including UserChoice, Certificate 3 Guarantee, SQW, CSQ & BERT. We can give you advice and guidance on which funding options fit best with your skills and goals! With multiple locations and flexible delivery options Major Training Group is a genuine training partner for skills, knowledge and career growth that will quite literally put you in the driver’s seat. Major Training Group training courses are delivered by a genuine, enthusiastic, and knowledgeable team in Brisbane, Sunshine Coast and Gold Coast with a well maintained fleet of modern vehicles. Take your truck driving to the next level, or get qualified across all vehicle classes. 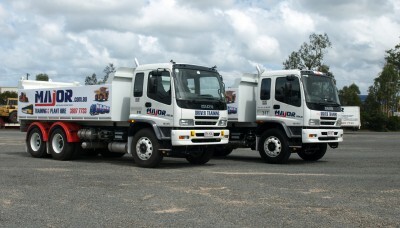 An HR truck Licence from Major Training Group will make it happen. A HR truck Licence from Major Training Group automatically includes qualification to drive Medium Rigid or Light Rigid vehicle classes; we also offer the separate course for each of those classes in Brisbane, Sunshine Coast and Gold Coast. Offers total flexibility based on individual needs. Book lessons over a few weeks leading to a test time that suits. 1 or more hours at a time. We recommend 2 hrs at a time for better learning outcomes. Up to 12 hours of training over 3 or 4 days including drive time and practical test. Book 3-5 weeks in advance. 8 hours of training including test with Qld Transport. can be continuous or made up of different individual lengths of time (excluding any time that your licence was suspended, surrendered, cancelled or expired). Pay test booking fee to Department of Transport and Main Roads. You can practice for your test with Queensland Transport’s practice road rules test. Want more than a HR licence? Get a nationally recognised qualification with a Certificate III in Driving Operations. We offer our training across the state in Brisbane, Sunshine Coast, Gold Coast and other QLD areas. Train for your Heavy Rigid (HR) Licence with Major Training Group and open doors to a rewarding career driving heavy, high-powered vehicles in the transport sector. Major Training Group is a genuine training partner committed to upskilling you for the future. Combine your Heavy Rigid Licence with a Certificate III in Driving Operations or take part in a Fatigue Management or Load Restraint Course to further your options.